As dawn broke over Chivato Mesa, a group of New Mexico Department of Game and Fish biologists, conservation officers and volunteers fanned out in search of calving elk. They climbed hilltops and used binoculars and spotting scopes to scan the vast meadows and clusters of scrub oak that dot the countryside. 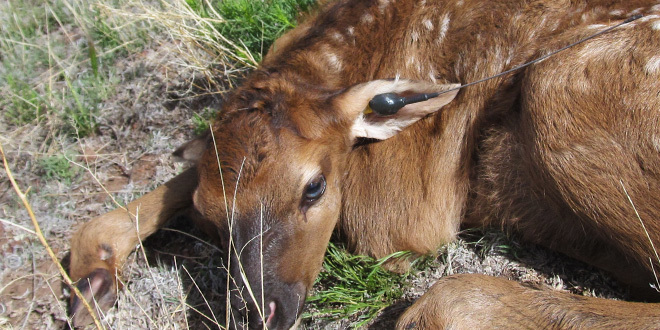 Above: An elk calf lies still after researchers attached an ear transmitter. Calf survival has been low in the Mount Taylor area and researchers are trying to understand the reason. In the event of a death, researchers can respond to the scene quickly to identify the cause. NMDGF photo by Katelyn Shanor. In the distance, Mount Taylor loomed as the sky faded to white in the June heat. The group were looking for a lone cow elk wandering off into a thicket to give birth or retrieve a hidden calf. 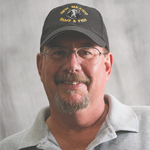 It was s a long hike with no guarantees, the crews were highly selective of where they searched. The work got easier when the department’s airplane arrived to track radio transmissions from collared cow elk that have expelled vaginal implant transmitters upon giving birth. But it was the arrival of a helicopter that re-ally improved the crew’s odds. Calves were spotted from the air and easily captured as they hunkered down to hide from the noisy copter. Calves were caught and released quickly to reduce stress, and in most cases the crews watched as calves reunited with their mothers. After several weeks of work using these methods, crews were able to capture 38 calves, a large enough sample size to con-duct a definitive, scientific study. The tagged calves will be monitored from aircraft and on the ground so any mortalities can be immediately investigated to determine the cause. Calves can die from many causes, including predation by coyotes, bears, cougars and sometimes golden eagles. Other potential reasons for mortality are disease, abandonment or other natural causes. 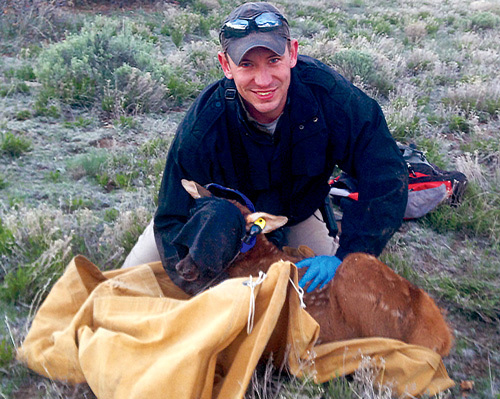 James Pitman, elk program manager for the Department of Game and Fish, with an elk calf fitted with an ear transmitter. The eyes of the animal are covered to minimize stress. NMDGF photo by Storm Usrey. Conclusions from the study will be helpful to the department as it makes future management decisions about the Mount Taylor elk herd.